This blog is about the progress I made with Lady Jane and the start of a completely different lifestyle with Arctic Rose, and other fun stuff. Finally, the clocks have changed and we are now officially in British summer time. Great - No more long dark and cold nights. Loosing that extra hour under the duvet is a small price to pay for the extended light in the evenings. I already saw someone in shorts barbecuing on their boat over the weekend. 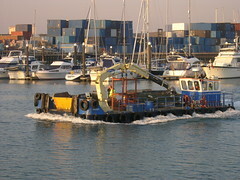 So far as Lady Jane goes, the shift will be towards outside projects as the weather starts to improve. Sadly, not everything goes according to plan. This is the sight that greeted me at the end of a couple of days hard work over the weekend. 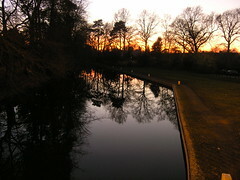 At the time the temperature was hovering around 4 C, wind gusting to a force 8 and it was getting dark. The last thing I need when I'm all packed up and ready to go home for a nice, long, hot, relaxing bath - with a cool beer to hand. Grrr. Completely my fault, as the rib should have been left facing the prevailing wind and the outgoing tide. Get cold and wet opening the rib's (hbi) elephant trunks, the drain tubes at the back of the rib, then take the rib for a spin to drain it out while getting even colder. Use the flat sided bucket I was so proud of. Just not practical given the volume of water, though I suppose I would soon warm up. Unlock everything, get out the generator and mains electric pump I was so happy not to have to be using, and let technology take the strain while I stay dry. Let the little on-board bilge pump to do it's thing. Not even remotely a serious option here. It's not hard to guess which option I chose - Handy thing that mains electric pump. There seems to be a twisted sort of poetic justice going on here. Ahh well, if I couldn't take a joke I wouldn't have bought a boat, or two. Sunday morning, some thoughtless organisation saw fit to pollute the Itchen River, and presumably elsewhere in Southapton. 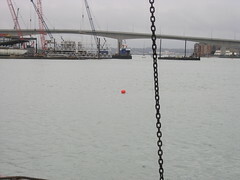 The Itchen River was dotted with red balloons, like these you see in the picture, part of the fallout from what must have been a mass balloon launch in Southampton. Surely there should be a ban on this kind of thoughtless litter? I rescued the few balloons I could reach, and saw people on other boats doing the same. What were retrieved is nothing, compared to the ones that still litter the river banks. This kind of 'throw away' activity simply adds to the existing plastic waste problem we all face. I hope 08 mass balloon releases are stopped, and the pollution ended. Those 'pretty' balloons have to come down somewhere, where they are just a nuisance and potentially a danger to wildlife. This has to be one of the most unexpected surprises of the varnishing experiment. 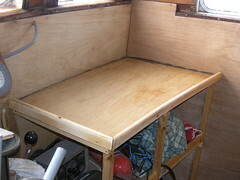 The original wooden floor of the wheelhouse has always seemed to be a bit damp, until I installed the central heating system. 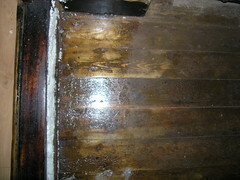 The floor is usually covered with a bit of carpet, an offcut from elsewhere, so the state of it is not really visible. At one point I had some varnish left over in the pot I was using, so decided to 'run it out' on the now dry wheelhouse floor. The result, particularly where I've given it a second coat, is astonishing. That's with no preparation at all. With some serious sanding that wooden floor could look wonderful. This picture does not really do it justice, but I'm pretty happy with my varnishing experiments progress. What really impresses me is just how good that wood looks after a few coats of varnish. Compare the wood above and below that top shelf for example. Obviously I'm going to have to complete varnishing the rest of that woodwork sometime soon. 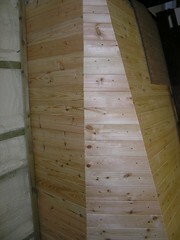 Oddly enough, the pine does not seem to change colour as much as the plywood. I would have expected it to be the other way round somehow. Anyway, I'm quite looking forward to seeing the effect down below once all the woodwork is complete. Yesterday's deckhead insulation picture was a little out of context, I know. 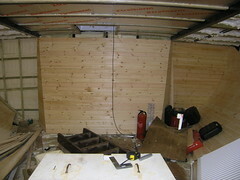 Here you see the overall impact of recent progress in the aft accommodation space. It's becoming progressively easier to envisage the place as it will be with the woodwork completed, and varnished, and a ceiling in. I also notice that this space is becoming that much better to be in, especially now it's warm down there. I know the picture does not show much, but it is pretty significant. What you are looking at is a section of the recently completed insulation of the deckhead down below in the aft accommodation space. With the heating on, the difference in temperature before and after the insulation, relative to the galley above, is very noticeable. 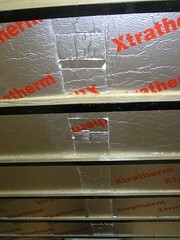 I'll also see about putting insulation sheeting over the exposed steel beams. Every bit helps, as come summer it should also help keep things cool down below. 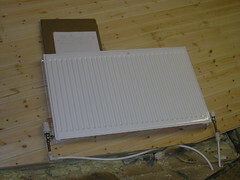 Until now I've been toughing it out, or relying on the rather more lazy approach of using an electrc heater. Andy's visit finally prompted me to get a radiator in. Last time he slept down there, in his hammock, he reported being very cold during the night. It's one of those times that I think "why didn't I do that earlier?". 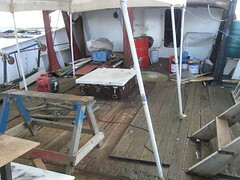 Obviously some tidying up on deck is needed pretty soon. As soon as the weather improves it will be time for another rubbish tip run. The accumulated mess you can see is the inevitable fallout from the various projects I have been working on over the last few months. In other news, it's almost exactly a year since Lady Jane came round from Fareham. 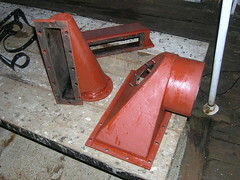 Here you see the port side 'tricky bit' completed. Andy came down for another visit and completed this section on his own. Saturday afternoon was spent mumbling and cussing over scribbled drawings on scruffy pieces of cardboard and bits of tortured wood. From nothing, by early Sunday afternoon the whole lot was complete as you see it. Puts my efforts on the starboard side to shame. Thanks for a job well done Andy. The header tank for the head (toilet for you landlubbers out there) finally has a pump permanently plumbed in. My original expectation was that pumping seawater into the header tank, with the electric pump, from time to time was not going to be a problem - not so. That header tank would run dry at the most inconvenient times, and would do so surprisingly quickly with visitors on board. To pump seawater into the header tank meant getting the pump out, unravelling everything, getting an extension lead out and connected, pumping the water, then stowing it all away again. In the end it just ended up being a nuisance. As it turned out, installing this, very good, manual whale pump took no longer than it would have taken to go through the whole palaver with the electric pump. Now anybody can top up that tank - it's that quick and easy to do. I've mentioned this before, but I really need to get a grip on the mains power supply on Lady Jane. Mains power is 240 volts here in the UK. Here you see the space where this is all destined to happen, after a tidy up obviously. 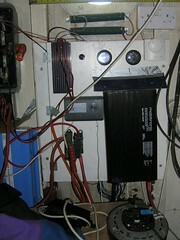 The 24 volt system in place currently provides light to most of the essential spaces on Lady Jane. Beyond that I use mains power through extension leads for everything else. Even the fridge is run off of an extension lead. I remember Dave laughing progressively harder at each new extension lead I found when we were first on board, nearly four years ago now. As I recall, he nearly fell overboard he was laughing so hard when I found the, melted, 40 metre extension lead. Since then I've been out and bought even more extension leads! To get a grip on this situation, I initially need to get a sensible method of switching between the various incoming power sources I have. Right now I have 3 separate 240 volt generators, of varying sizes and applications, and two invertors, one a pure sine and one a higher wattage pseudo sine invertor. I potentially also have shore power input as well. With incoming power sorted, I need to install an RCD distribution board, proper spec wiring then mains sockets at places throughout the boat where I need the power. Waterproof sockets on deck of course. It would be so good to have a proper earth, correct fusing and power distribution taken care of for once and for all. The great varnish experiment continues. 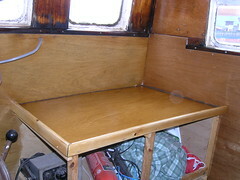 I'm now trying yacht varnish, as opposed to the satin finish polyurethane which I used before. Apparently the harder film formed by polyurethane varnishes are not supposed to be that good for soft woods like pine, which is what I'm primarily concerned with for down below, as it tends to de-laminate and go white if subjected to heat or shock. Here you see the starboard side of the wheelhouse being given attention. This has just been sanded down after a first coat of varnish has been applied. This time, despite the manufacturers instructions to the contrary, I've thinned the first couple of coats - 50% for the first and 25 % for the second. This is following the advice given by so many on the internet. I've noticed that the first coat of varnish soaked deeper into the wood than last time, presumably on account of the thinning, so I suppose that can only be a good thing in terms of protecting the wood longer term. The next coat of varnish I do will have no additional thinning, so the results proper should start to show. One thing I really do notice is that the presence of dust is definitely a factor in the quality of the finish. Yes - I'm going to write a blog entry about a bucket! 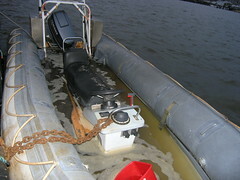 One of my pet hates about the rib is having to bail it out after it's rained. My bilge pump is notoriously unreliable. Fuses blown for no apparent reason or stuff blocking the impeller just after a heavy rainstorm are my pump's favourite tricks. I know I could use a cover, or I can get a better, float switch, pump, and use a split charge diode and a second battery, but I'm trying to keep things simple. The less there is, the less can go wrong. 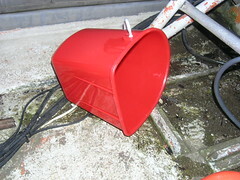 A flat sided bucket. Hmm, that would work great for bailing. Especially when the water level goes down a bit. As it turned out, it rained the day after my fire bucket was delivered. That has to be the one and only time I was actually looking forward to bailing out the rib (in the dark). And yes, the bucket works just great. Until the recent stories circulating on the Internet regarding the phenomenon that is the trash gyres of the world, I had not really felt that compelled to change my lifestyle when it comes to plastics. I mean I already recycle and all that. 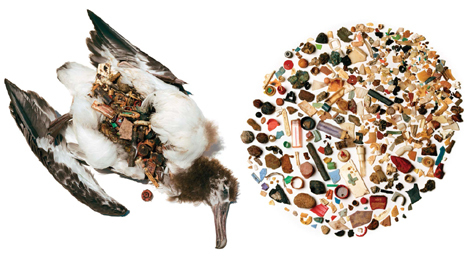 This picture is of the things that have come from ONE albatross. Try living with all that stuff inside you! In case you are thinking 'this is not happening', have a look here,if you have the stomach for it (scroll down a bit). The more I read on this, and the more I learn, so I feel increasingly ill.
We throw this stuff away without a thought of where it all ends up. After all, we have no control over where our rubbish gets dumped. I for one have no idea how much rubbish gets out to sea from the UK alone. There has been a lot of posting on this subject on the Internet in the last few weeks, including a healthy amount of vitriol and skepticism, the best post I have read is at The Oysters Garter" which puts things into perspective pretty well. It seems hard to conceive of how it could be possible to cleanup the mess we have all contributed to, in some way or other, over the last fifty or so years. What seems harder to grasp is just how to prevent this problem from getting worse. Take an interest in where your own garbage ends up. Sometimes, through this blog, I think it seems to folks that all I ever do on Lady Jane is work. Being on Lady Jane is not a job, more like a lifestyle, and it's not all work of course. I really love sitting reading up high in the wheelhouse, warm and cozy, where I can see all the activity on the river about me if I choose to do so. Here I'm taking a break from reading to get a picture of one of the more unusual vessels, the Wilkit, threading it's way down the river in the late afternoon sunshine. Interestingly the Wilkit splits into two, making it easy(?) to transport virtually anywhere by road. Obviously they are on their way back from somewhere or other after a days work. I'm not even feeling slightly guilty for doing nothing but laze about and read all day. Here you see the covers for the intercooler, before re-assembly. The new gaskets are just visible in the background. I did exactly as I intended, put the turbo side covers on first, ran the engine to blow any remaining stuff from inside the intercooler, then put the inlet cover back on and ran the engine a second time. Hmm, the mess I made by running that engine with the intercooler cover off was pretty spectacular. There is no doubt about that turbo's ability to blow air through, along with the residue of the cleaning solvent etc. With all the intercooler covers back on, the engine runs just fine. Probably the best it's run since I've had Lady Jane, although John will need to take if for a spin for the final verdict. The turbo pressure gauge only shows a slight pressure, but I'm pretty sure it's the pipe for the gauge that's all gummed, up as per the turbo. To check there was pressure, I took off one of the pressure gauge connectors and, sure enough, air blows through the fitting. But I knew that anyway from the first run with only the turbo side covers on. The only snag is that I did not make a new gasket for the piece where the actual turbo joins the first intercooler cover, so I have a small air leak there. Next, asides for making another gasket up and fitting it, I need to cleanup the mess I made while cleaning the intercooler, rust bust and cleanup the rest of the intercooler, then prime and paint the thing and all the associated pipe and duct work. Light blue I think - to denote compressed air. Oh yes, and I'll also have to clean out the suspected blockage in the turbo pressure gauge pipe. With the intercooler all painted up and looking smart, this project can then finally be closed off.